A makeshift memorial stood Saturday at the intersection where the crash happened. 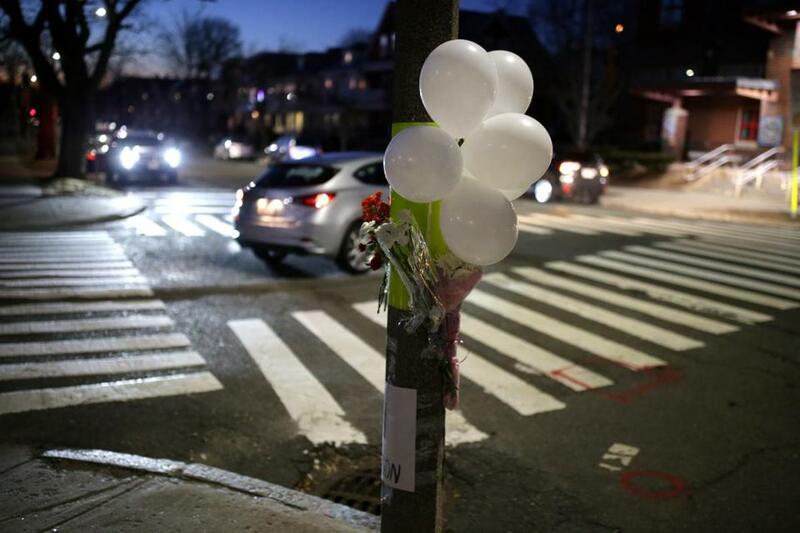 A Somerville official is urging immediate infrastructure changes be implemented at Powderhouse Boulevard, after a woman was fatally struck in a crosswalk there on Friday night. Allison Donovan, 40, a Watertown educator, was one of two women hit near her home at about 7:16 p.m., according to the Middlesex district attorney’s office. Both women were taken to Mount Auburn Hospital, where Donovan was pronounced dead. The other woman, whom police have not named, has been discharged. Police are requesting the public’s help to identify the driver of the black pickup truck who fled the scene after the crash. In a Facebook post Saturday, Ballantyne said she had requested the meeting to discuss how to implement her proposals, which include narrowing the roadway with wider parking lanes, putting in a series of speed bumps, having greater police presence, and improving signage. “A vast majority of data shows us that these traffic calming and safety features will reduce vehicle speeds and improve safety, which in turn could prevent yet another tragedy like this in future,” she said in the post. She said police had confirmed that officers will be present going forward during pickup and dropoff hours at the West Somerville Community School near the spot where Donovan was hit. Ballantyne did not immediately respond to requests for comment Sunday. Donovan was a beloved resident of the street for more than a decade, neighbors said. She was a K-8 literacy coordinator and Title I coordinator for Watertown Public Schools, according to the superintendent of Watertown public schools, Deanne Galdston. “She meant so much to so many of us: staff, students, colleagues, and friends. We are so saddened over this senseless loss,” Galdston said in an e-mail Saturday. Watertown school staff members were preparing to support students and planning to meet Sunday about how to share the news with them when they return to school Monday, Galdston said in her statement. Donovan was also a former principal of a Melrose elementary school, where parents and teachers are developing plans to honor her, according to the Lincoln Elementary School Parent-Teacher Organization. The University of Massachusetts Lowell, where Donovan was a former student, also shared condolences. “UMass Lowell is sorry to learn about the passing of former student Allison Donovan. Our thoughts are with her family and friends during this difficult time,” said spokeswoman Christine Gillette in an e-mail. In the post, Ballantyne, the Somerville councilor whose ward includes the section of Powderhouse Boulevard where Donovan was hit, said that although changes are needed, it is most importantly time to mourn. “Our first concern, in the immediate wake of this tragedy, must be to offer condolences and prayers for healing and peace to our neighbors who are most affected,” she said. But she said the process to make changes should begin immediately. “We must act now!” she said.